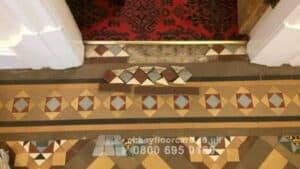 The floor is around 80 years old and in and in very good condition considering its age. ingrained soiling – over the years the surface has worn leaving points and voids that have filled up with soil. old gripper adhesive – whoever had removed the old gripper had done a good job, but they could not remove all traces of the old gripper adhesive. old worn surface sealer residue – the tiles had been sealed with an surface sealer but we were not quite sure what type of sealer had been used. The gripper adhesive was treated with a gel solvent stripper. 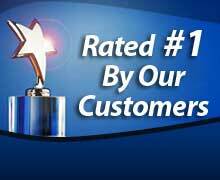 The rest of the floor was treated with a broad spectrum sealing and coating remover. The treatments were left to do their work for a couple of hours. Now we used rotating brushes and cleaning pads to remove the sealer removers and residues. The edges and corners were cleaned by hand to get right to the edge of the skirting boards. Once the floor had been carefully rinsed and dried we found a number of areas that heeded re-treatment. It finally took 4 treatments to get the floor beautifully clean. We could have got this floor clean quite quickly if we had used our high pressure rinse and capture equipment but we did not want to risk driving water into the subfloor and creating problems later on for the customer. So whilst it tok longer to get the floor clean, the floor is still nice and stable and there will be no problems in the future. 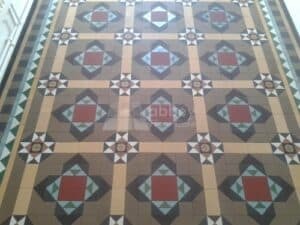 When an old clay tile floor has been cleaned, the colours can look washed out, especially the yellows. This is because the biscuit top layer slightly deeper in colour and over time it wears off. Just like cutting the crust off a loaf of bread. So we applied a stone oil treatment. 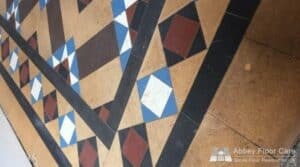 This brings the colours back to the tiles, with the added benefit of providing some protection and still allowing the floor to breathe. Once the stone oil had cured, we applied a penetrating impregnating sealer to add more protection to the floor, yet retaining its ability to breath. 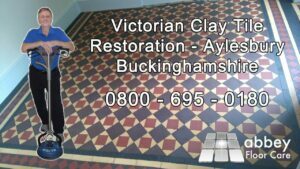 The result is a minton tile floor that looks as if it has been carefully cared for so retaining a beautiful finish. The client was absolutely delighted with the clean and the finish. There were particularly impressed with the vibrancy of the colours. We carefully explained the importance of looking after the floor properly, using the tight cleaners and pop systems. So their floor will continue to look beautiful for years to come. 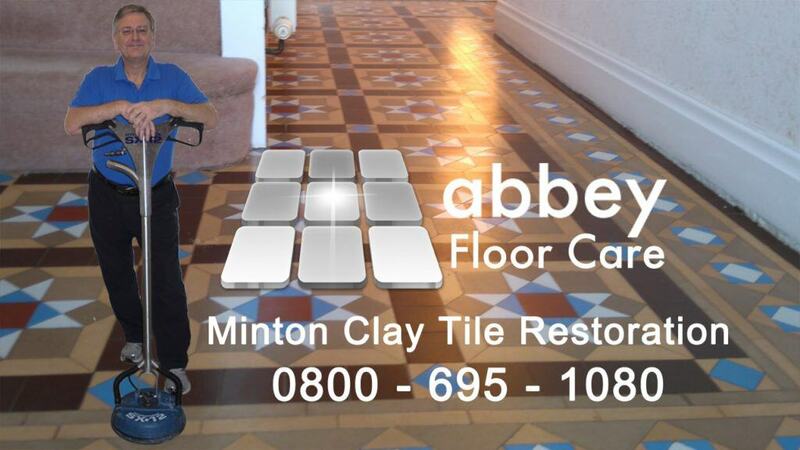 If you would like your minton tile floor or any other kind of stone floor restoring to a beautiful finish call Abey on 0800 695 0180 or complete our simple contact form on www.abbeyfloorcare.co.uk.